Posted on August 22, 2016 by Al B. While not fatal to the environment (at least that we know about due to Navy secrecy), it is a reminder of how at risk our Strait and Coast are to possible radioactive contamination if one of these vessels has a catastrophic failure due to a crash. How their support vessel crashed into them is something I hope we get more information on, from the Navy. Perhaps Derek Kilmer’s staff can ask for clarification? BANGOR, Wash. (AP) — The Navy says a ballistic-missile submarine and a support vessel collided off the coast of Washington state. There were no injuries from the Thursday evening incident in the Strait of Juan de Fuca involving the USS Louisiana and the offshore support vessel. In a statement, the Navy said the collision occurred during routine operations. 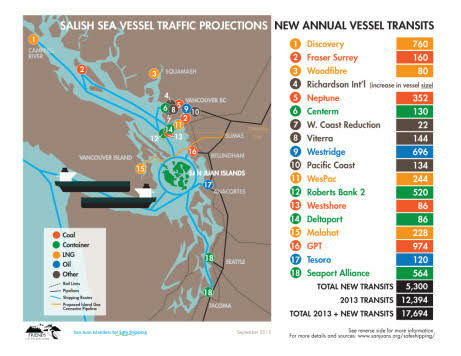 The battle is on to stop the expansion of shipping oil through the Strait of Juan de Fuca and the Salish Sea. Our gems, the San Juan Islands, lie directly in the path of a huge increase in vessel traffic, much of it carrying very destructive processed oil. Here are facts, based on the filings of the companies themselves. Great news from the North Olympic Land Trust. If you have not been to the Lyre, it’s a beautiful small river out west of PA.
A 280-acre property that is important to several salmon species and wildlife will be permanently conserved, thanks to its recent purchase by North Olympic Land Trust. The property abuts the Lyre River on the Strait of Juan de Fuca, about 20 miles west of Port Angeles. This property features an important estuary at the mouth of the Lyre River, streams, wetlands, tidelands, kelp beds and bluff-backed beaches. It also includes a large upland area with a diverse forest at various ages of growth. The Land Trust and local partners bought the property with grants from the state’s Puget Sound Acquisition and Restoration (PSAR) Fund, Marine Shoreline Protection Fund, and Estuary and Salmon Restoration Program. The Land Trust also contributed its own money. The previous land owner has also provided a donation to pay for ongoing stewardship of the property. Critical partners include the North Olympic Peninsula Lead Entity, Washington Department of Fish and Wildlife, the Puget Sound Partnership, the Lower Elwha Klallam Tribe, and the Makah Tribe. This project was ranked eighth among regional large-scale capital projects for 2013-15 PSAR funding by the Puget Sound Salmon Recovery Council. This ranking was based on impact to salmon recovery, project readiness, and how the individual project would advance Puget Sound Action Agenda targets. Planning is underway for the use of the property. Visitors will be able to park about a mile from the beach and walk in from there. Visitors can enjoy day-use activities such as birdwatching, wildlife viewing, surfing, picnicking, and beach walking. The area will be closed to all motor vehicles. This property purchase is a win not only for the community, but also for the mission of the Land Trust: conservation of open spaces, local food, local resources, healthy watersheds and recreational opportunities. Long-term goals of the Land Trust are to conserve lands that sustain the ecological and economic vitality of the communities of Clallam County. The Lyre property includes the 3,000th acre that the Land Trust has conserved in Clallam County. This property will join other areas permanently conserved by the Land Trust through ownership, including properties on Elk Creek, Siebert Creek, and the Pysht River. The Land Trust also conserves land through voluntary conservation easements with private landowners. These agreements are in place on properties across the county, from the Bogachiel River to the Miller Peninsula. This purchase pushes the value of total land conservation by the Land Trust to more than $14 million since 2007. For every unrestricted dollar donated by supporters to run the Land Trust, the organization has conserved $16 of land in Clallam County. Posted on September 20, 2013 by Al B. An uncommon species of kelp was found last week off the Elwha River mouth — possibly a species that has not been seen there before. A team of scientists found the kelp, thought to be Laminaria ephemera or Laminaria yezoensis, during a survey of the Strait of Juan de Fuca near the Elwha River mouth and brought it to the Feiro Marine Life Center on City Pier for temporary safekeeping. “There is something strange going here, something different,” said Steve Rubin, a fishery biologist for the U.S. Geological Survey. Arwyn Rice reports.